My youngest son is 5. He’s a typical boy -- he gets dirty, plays rough and can hardly sit still. But he has a soft side to him as well. Many times I’ve sat on the park bench and could overhear other mothers commenting on my older child, who is on the Autism Spectrum, doing something irregular. Like refusing to get out of the plastic tube or sitting under the slide. I’m becoming used to strangers commenting on L but it takes me aback when strangers feel the need to remark on my “sensitive” boy. As if it’s not okay to be a boy who actually expresses his emotions. “I don’t think I’d like Z to grow thicker skin, it’d be gross!”, L says since he was sitting on my feet and could easily overhear the grandfather talking. He’s looking up at me, making eye contact and I’m the one to look away first while I try and gather my thoughts. I struggle with this one though. I don’t want to send the message to my children that it’s not okay to cry or to show your emotions. I don’t want to raise boys who hide their true feelings and bury it deep within. Those aren’t the men I want in the world. That being said, I will be the first to admit that Z can go a bit overboard on the crying. “Umm ... when that man was a little boy, a long long time ago, he wasn’t allowed to cry. It was considered a sign of weakness---” I said. I will admit that there have been times when I may have rolled my eyes, when Z wasn’t looking, because of his crying outbursts. That has more to do with my particular level of patience at that moment and nothing to do with the belief that boys are not allowed to show their emotions in our society. I want all of our children to be able to express themselves and not feel ashamed of their feelings. 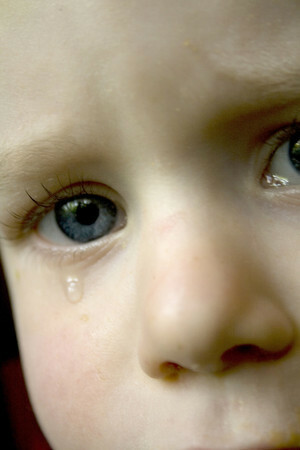 How do you tell your children that it’s okay to cry? That it’s okay to hug their friend. And that men who “wear their heart on their sleeves” can do great things in this world.